Is there a better truism? Not for me. 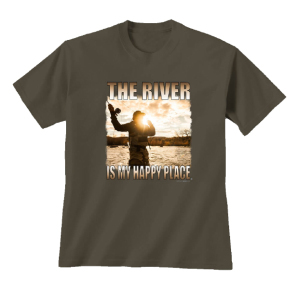 As I have gotten older, had more experiences and become wiser—the fact is a day spent on the river remains my happiest place on earth! High quality Olive T-shirt features pre-shrunk 100% cotton for a soft fit that never changes. The seamless collar won't chafe. Double-needle stitched neckline, sleeves and bottom hem for durability.